reasonably priced unit tat works? I don't understand why your power supply won't work. Most of axle setups I've used range from 1/2 to 3/4 amp running no load at 6 volts. While trueing I've never gone over an 1 amp so you should have more than enough power. What voltage are you setting it at while running? This should be more than adequate to run your Tire Razor. Thanks for answering Dave. It must be a defect in the power supply. As soon as I hook up the axle to the Tire Razor and turn on power it rotates for a few seconds and then stops. I have broken in motors at 4 V with no problem but it seems as soon as I hookup the TR the unit falters. If your power supply has a variable amp control be sure to turn the control all the way up, otherwise the unit will cut out if you apply much of a load. If the unit has an amp meter make note of the reading when the Tire Razor is not actually grinding and also what it reads during the grinding process. When you are truing tires it is not a good idea to apply much pressure for several reasons. For one thing all that holds the axle assembly in place is the drive belt, if you apply too much pressure the axle assembly will start to wobble. When you are truing tires what you need to do is gradually grind off the high spots. If you apply too much pressure the tires get compressed and you might reduce the diameter of the tires without getting them round. Thanks Rich.... My unit does not have a variable amp control or amp meter. As soon as I put on the drive belt the problem occurs after a few seconds of the tires spinning. This happens even with no contact to the sanding plate. I think it is the unit. 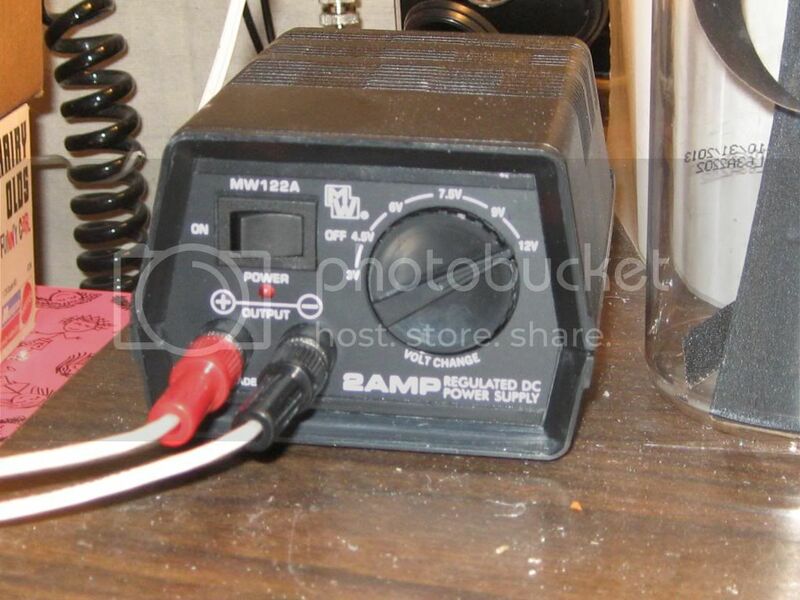 It is a Wreckord 15 V / 2 amp unit. It works fine for breaking in motors but won't function correctly when using tire razor. In #2 Dave asked you what voltage you were running the power supply at while using the Tire Razor? If it is still set at 4 volts (what you said you were using for breaking in motors), you may want to try a higher voltage (like 9 to 10 volts). I'm not that familiar with the Tire Razor, so I do not know what others are using for voltage to run theirs. I've turned up up to 10 and the tires will still not rotate...don't think it is issue with my settings. Ok, I had a similar problem with my commutator lathe. It uses a similar RC motor to drive the lathe with a belt drive on the armature. It would not spin the armature with my 3 amp power supply. I ended up buying a TekPower TP3010E DC Adjustable Switching Power Supply 30V 10A from Amazon for $110. Works great. I can run the lathe at 3 volts if I want to. Thanks Jim, I guess a will have to purchase a new power supply. I will check out the TekPower! I did a search for your power supply, but the only thing that turned up was this thread. It looks like your power supply is simply too skimpy for running a truing machine. I use a 5 amp power supply with no problems. If I was doing two tires at once I set the pressure to get a 0.5 amp draw. Another machine that I use draws 1 amp before I even start grinding. If you do buy another power supply you might get one that you can also use to power a track, in that case I would recommend a minimum of 10 amps. that wimpy (IMO- lol) P/S shown will run my tire razor down to almost stall at the 4.5V setting, but not at the 6V. they are cheap, though. other machines may (and some do) draw a lot more current, depending on the electric motor, multiple belts and shafts, etc. I added a small, self-powered inexpensive surplus 3-digit LED panel-type Voltmeter to this thing so that I can keep an eye on it. at least these supplies don't fold back; they just run out of steam sometimes. I use a 15V 5A HY1505D supply for my truers so that I don't have to worry about it. it has two meters so that I can see what it's putting out. i use the MW122A for other things (such as breaking in cars). it sits nicely on top of the tall one with its meter tacked in front, once I added a set of rubber feet to it. it runs a lot cooler now that air can get in the bottom as well, so I've done this to a couple of 'em. as an aside, I've bought a total of four of these things over the years, and paid a lot less on average than good Jon did. one I modified with a control pot replacement for the clack-clack Voltage selector. one serves the purpose described above, one charges/maintains NiCad battery stacks, one I gave to my buddy for his HO cars, and the last one I melted down because I walked away leaving too steep a load on it. like I said, they're cheapos, so they don't have any brains. I use a 1.8 amp switchable universal adaptor. Works OK. Keep raising the voltage until it turns fast enough. I think the dial says 7.5v but what the actual is I don't know.